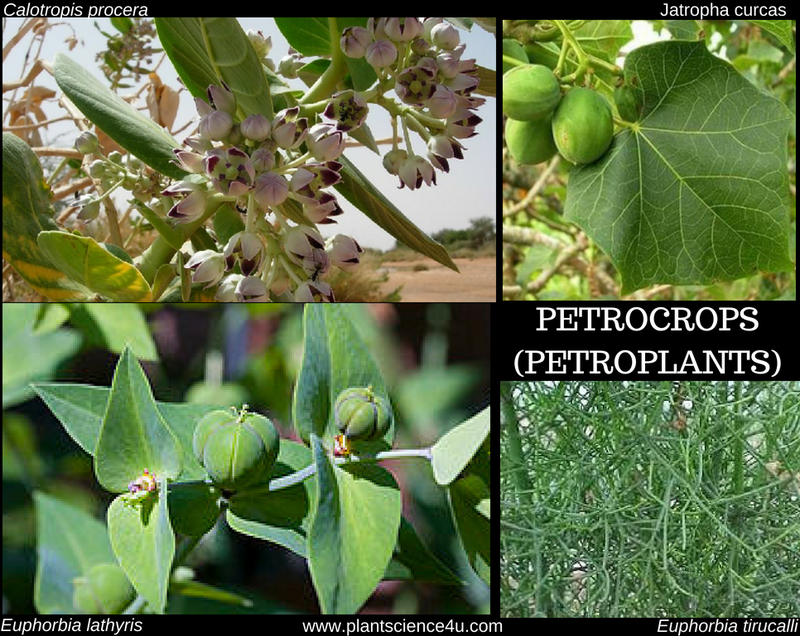 Petroplants are the plants which provide liquid hydrocarbons as a substitute of liquid fuels. The hydrocarbons present in these plants can be converted to petroleum hydrocarbons. The oil crisis during World war II had led the Italians and the French to switch over to petroplants for petroleum production. The thick milky latex, extracted from Euphorbia abyssinica was used in gasoline refinery. In 1970, Melvin Calvin showed the feasibility of procuring petroleum substitutes from certain specific groups of plants which are rich in hydrocarbons. Gopher plant (Euphorbia lathyris, milk bush (Euphorbia tirucalli) and milk weed(Calotrophis procera) are important petroplants. One advantage with the Euphoria plants is that they can grow even in semiarid lands and do not require irrigation and fertilizers for their growth. Certain tree species, such as Copaifea landsdorfii and Copaifea nultijuga are rich in oil . A single tree can give as much as 20-30 litres of oil in 2-3 hours in a single tapping. in the United States, a blend made of sunflower oil and diesel called sunoil, is widely used in diesel engines. similarly, coconut oil is mixed with diesel to give a blend, called cocodisesl, for use in diesels engine. There are many species of Euphorbia which yield fuel oil resembling rude oil. Euphobia lathyris is an example.